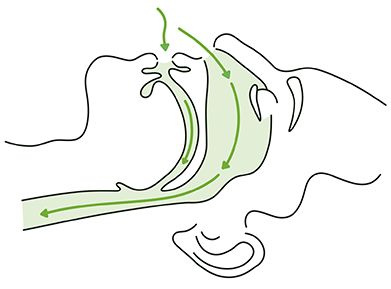 The most obvious sign of obstructive sleep apnea is chronic, loud, and ongoing snoring. There is usually, too, persistent sleepiness during the day, including while at work or driving. This may cause the sufferer to doze off during periods of inactivity. Other symptoms include morning headaches, waking frequently throughout night, difficulty concentrating and remembering, psychological problems such as depression or mood changes, and sore throat or dry mouth upon waking. 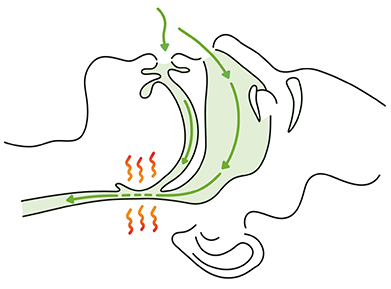 With normal breathing, which supports the restorative sleep that is so important to human health and well being, air flows freely through the upper airway. There is no obstruction to hinder breathing. 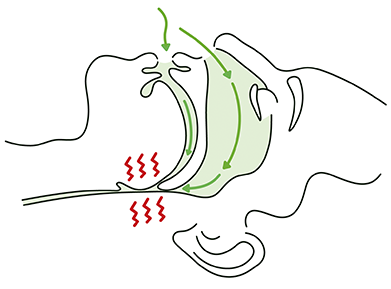 Do you think you may suffer from obstructive sleep apnea? Find out with this simple test.